Car for Guinea: Mabel Saah with the car she is giving to her son to help him support refugees in Guinea. “YOUR car or your life?” was the ultimatum armed rebels had for Mabel Saah as they stormed through her neighbourhood in Monrovia, the capital of Liberia in West Africa. She had no choice; she handed over the keys and left her home with her six children – never to return. That was 27 years ago, and now the Annerley Ekibin parishioner is about to hand over another car, but this time it will be freely given. And it will be given to her son Joseph for him and others to use in their work with refugees in Guinea, a country bordering Liberia. Joseph is helping people facing the same nightmare that he and Mabel and his five siblings faced when they fled their homeland. Mabel and her husband Dr Dominic Saah had left their home with the children, and had been seeking shelter elsewhere in Liberia when the rebels attacked there as well. “I told my husband, ‘I’m going to go now. I’m ready to go’,” Mabel said. Up until then, she had been reluctant to flee the country. “We started to walk at six o’clock in the morning. We went to my brother’s house (near the United States embassy), with my husband,” she said. At midnight, the government began to fight back against the rebels. The next day, the Saahs fled. “We had no clothes (but for the ones they were wearing) – only a few things. We had some food. We had a wheelbarrow,” Mabel said. “We walked all day till six o’clock in the evening to Amadou town. It didn’t prove so safe because rebels moved in and took Dominic. Mabel said the rebels killed anyone who was on the side of the government, so her husband was targeted because he was a paediatrician in a government-run hospital. She and the children crossed into Sierra Leone seeking refuge, and, having worked as a teacher and a leader in education in Liberia, the UNHCR (United Nations High Commissioner for Refugees) employed her to work with the children there. The refuge was short-lived because rebels then entered Sierra Leone. “I said, ‘I’m going to go to Guinea’ … because it was the only safe place at the time. There were no rebels,” Mabel said. Even then, she was arrested at the border and held for six hours, suspected of being a rebel. One of the people who helped Mabel and her family reach the border came to her rescue, telling the authorities she was his wife. She was not born to pray that way – her parents were Muslim. Their decision to send her to Catholic boarding schools set her on her different path of faith. She was taught to pray the Rosary, had to go to Mass on Sundays and was studious in reading the Bible. She came to love Christianity, and when she decided she wanted to become a Christian her parents didn’t stand in her way. They did object, though, when she told them she wanted to become a nun instead of marrying Dominic. Now her faith compells her to help the refugees and disadvantaged in Guinea. As strife continued in the region, Mabel sought refuge further afield and the UNHCR found her a place in Australia. She arrived in Sydney in 2006 and moved to Brisbane last year. 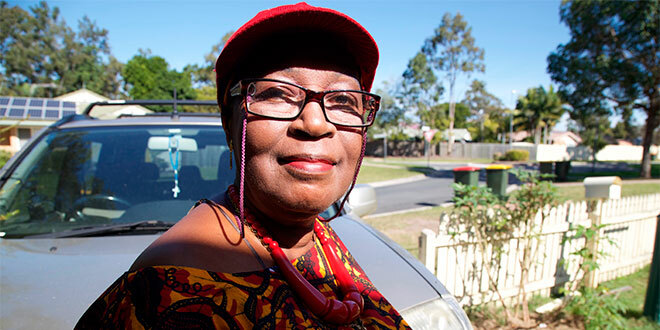 “When I got here (to Brisbane), my son called me (from Guinea) and said, ‘Mum, refugees are still here and some really need help. Can you help?,” she said. She’s sent two already, and is preparing another. That will include her own car, which she will leave behind for Joseph to use in serving the refugee families. “It’s because I have faith, that what you have you have to share with people,” Mabel said. “All this is coming from what little money I have worked for, and friends helping me because of my faith and (my) need to do charitable work. Because of the need in Guinea, Mabel says her efforts will be ongoing and she is establishing a group called Blue Sky Divine Mercy Mission. “I said Blue Sky because it’s going to have no limit, because the blue sky has no limits; it can reach anywhere. And Divine Mercy, (to) have mercy for everyone,” she said. “Because of my faith, I want to be a charity person and help reach the poor wherever the blue sky has no limit, and Divine Mercy has no limit. “I’m looking up to God now to help me. “I feel if God is not by my side I was not going to be alive at this time. “It’s only because of my faith that I’m living today. Mabel, with the help of her friends; fellow parishioners; the St Vincent de Paul Society; St Bernard Craft Group, Mt Gravatt; and St Laurence’s College is collecting goods to fill a 12m shipping container to the brim. She and her supporters are packing goods like non-perishable food, toiletries, medical supplies, clothing and Bibles. “In Guinea, some people are very rich but others are very poor,” she said. “People there are begging to eat. “If the container is full tomorrow, I’m going to go the next day,” she said with a broad smile. Mabel’s friends are planning a fundraiser for the Blue Sky Divine Mercy Mission to help with the purchase of medical supplies and long-life food as well as to raise money for Mabel’s airfare to meet the container in Africa. To support Mabel’s charity phone her on 0401 158 052.